Confocal.nl team developed a new camera adapter that makes it possible to image four colours without any crosstalk. This is ideal for example for immuno-stainings. The adapter is called a “Church-window”, and it was developed in co-operation with Chroma Inc. Idea itself was inspired by the church windows, like Chartres Cathedral and the good old Windows XP :). Looking familiar?? The new “Church-window” adapter for camera, for multi-colour imaging. Bypass mode – simplify your workflow! At confocal.nl, we value the feedback from our customers and users, and develop new ideas into solutions continuously. On popular demand, we have now implemented a bypass option on the RCM system. 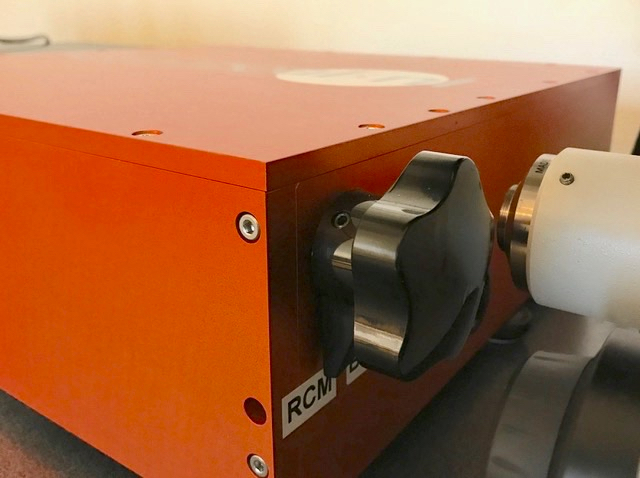 Bypass will greatly simplify the imaging workflow, allowing a quick switch between widefield and confocal imaging with the RCM camera. We value simple solutions that are easy to use. The bypass is a perfect example. A manual switch at the side of RCM unit moves into place a system of mirrors that redirect the emission light inside the RCM directly to the camera, bypassing the scanning mirrors. This allows standard widefield fluorescence and transmitted light imaging with the same camera used for high resolution confocal imaging. Bypass is a simple knob, added to RCM unit, switching between confocal and wide-field light path. The bypass mode not only allows efficient usage of the camera for both confocal and widefield imaging, it also provides an easy, fast focussing routine. With this improved workflow, simply bring the region of interest on your sample in focus in widefield mode, before switching to high-resolution confocal imaging. Interested in the RCM bypass mode to improve your imaging workflow, or want to stay up to date on our upcoming developments? Get in touch and let us know!